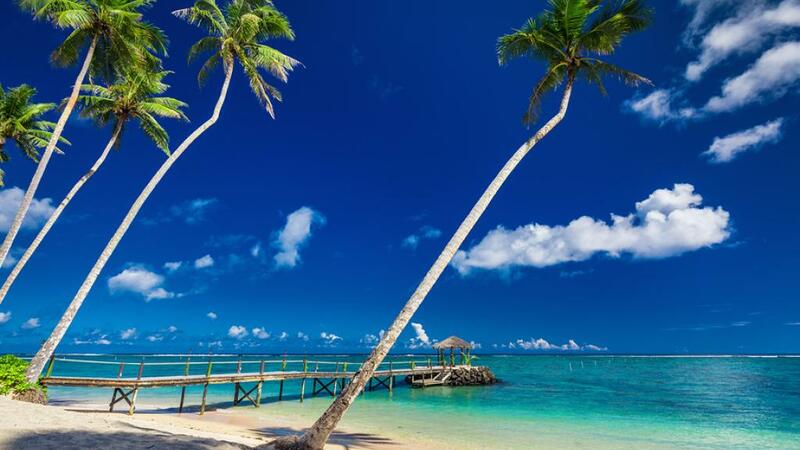 Located just 5 hours from the east coast of Australia, Samoa offers some of the most pristine beaches in the world. Sun-dappled sands meet a mesmerising palette of sapphire and turquoise seas, making Samoa an unrivaled tropical paradise. The two major regions of Upolu and Savai’i are home to a selection of unspoilt beautiful beaches, surfing hot spots and translucent lagoons that are sure to deliver endless holiday bliss. Samoa's beaches receive the best conditions during the peak season from July to September where the dry season brings sunny days, calmer seas, milder temperatures and less humidity. Here we have compiled a list of our favourite Samoa beaches. Situated on the south-eastern tip of Upolu, Lalomanu beach is ultimate relaxation paradise. Boasting kilometres of white sand, azure seas and a marine reserve teeming with tropical marine life, Lalomanu Beach has so much natural beauty to discover. Famous for it's cameo in the 2004 Gary Cooper film, "Return to Paradise" Lefaga Beach is a must visit destination. Featuring dizzyingly blue lagoons and giant clams beneath the water's surface, Lefaga beach is a special place to snorkel and scuba dive in Samoa. Rustic beach huts and coconut palms line the sand at Tafa Tafa Beach. A beautiful location to unwind and relax, Tafa Tafa is ideal for sunbathing, swimming and snorkelling. Home to an abundance of vibrant coral and marine life, Tafa Tafa is also a great place to find beautiful shells and natural souvenirs. Located on the east coast of Savai'i island, Aganoa Beach is a beautiful seaside escape and surfing hot spot. Home to the 2007 South Pacific Games, the offshore waves provide strong swell and fantastic left and right breaks, perfect for the experienced surfer. Offering traditional beach fale accommodation, Manese is a popular tourist spot on the north coast of Savai'i. The region boasts stunning beaches with golden sands and crystal clear waters as well as a great range of affordable accommodation.